A few days ago my sister unexpectedly went into labor at 33 weeks with her twin baby girls. I had made quilt tops for her a few weeks ago, but they weren't at the top of the priority list since we weren't expecting the babies to be born for another month. Both babies doing well and weighed around 5 pounds. They are going to be spending a little extra time in the hospital which gives me a little extra time to finish their quilts. I spent the last couple days finishing the first one and am hoping to finish the second this weekend. I knew I wanted to do something that was quick and colorful, so for this quilt I went with pink/orange/yellow (can you guess what the second quilt will look like?) HSTs. They finish at 5.75", making this quilt 36" x 41". My sister regularly uses the quilt I made for one of her other kids (this one), so I knew I wanted to make the quilts a good carseat/stroller size. The backing is from Alison Glass' Sunprint collection and the binding is from Elizabeth Hartman's Rhoda Ruth. I quilted it with an "organic" grid, meaning that I didn't mark the lines and made no real attempt to have them be perfectly straight. I really like the result and I particularly like that it doesn't involve marking lines. 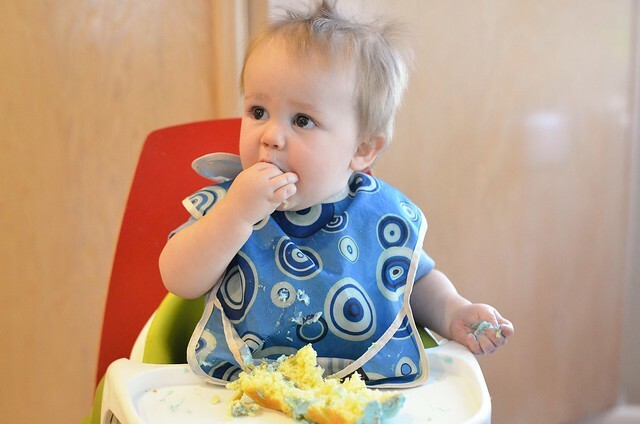 The twins were actually born the day after this little guy's first birthday. I can't believe my baby is one! Love your use of color in this quilt and thankful the babies are doing well! 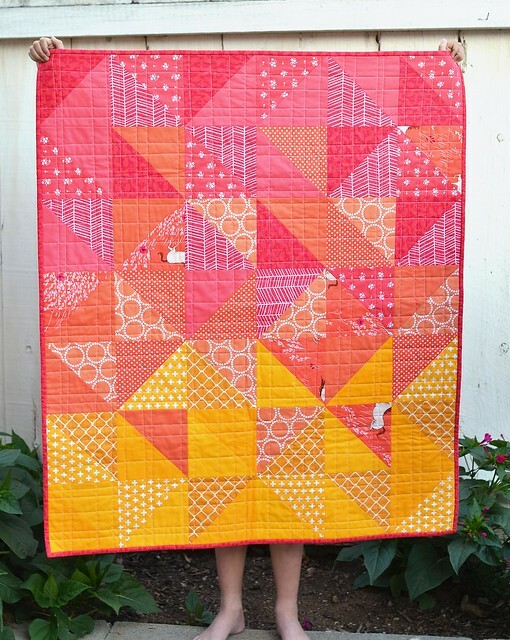 I am color crushing on this quilt! The palette is very summery and reminds me of a ruby red grapefruit - one of my favorite things! Great job with placement of the different color values and prints vs. solids too. Lots of movement, but with plenty of places for the eye to rest. Love the quilting as well! My twin girls were born at 33 weeks too. They are amazing 4.5 year olds now and it is hard to remember the bumpy start they had. Congrats to your family. Cute quilt! Happy Birthday to your little man. Those little girls were in a hurry to come into the world. Glad to hear that they are doing well. Love quilt number one and look forward to seeing number two. Great colours and I am a big fan of half square triangles. 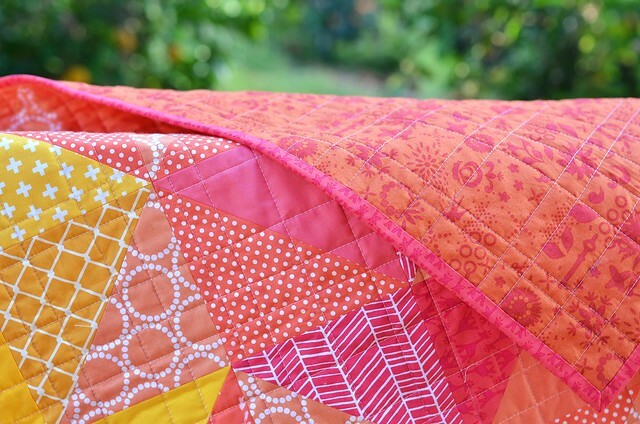 Love, love, love the colors you chose for this quilt. Glad the babies are doing well. Time does just fly. Too fast! My grandbaby girl turns one June 8. I love clustered birthdays, great for massive parties. This quilt is so cute. Best wishes to your sister and her baby girls. Love the colors, so pretty! Enjoy your new family members, that's wonderful news!